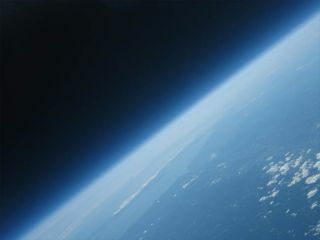 A picture of Earth from 93,000 feet, with Long Island in the background, taken by a camera launched on a balloon by MIT students. Two MIT students recently launched a digital camera into thestratosphere on a helium balloon, capturing amazing views of Earth from uphigh. The feat is impressive not just for theimages, but for its budget - the entire project cost the students only$150. Oliver Yeh, an MIT senior studying computer science andelectrical engineering, and Justin Lee, a graduate student in mechanicalengineering, lofted the camera Sept. 2 from Sturbridge, Mass. By tracking itslocation through the GPS readout of a cheap cell phone they launched along withit, the students were able to retrieve the package after it landed in Worcester about 20 miles (32 km) away. The resultingpictures are stunning, revealing the blue glow of Earth with the brightglare of the sun's reflection, contrasting against the blackness of space.Yeh's favorite shot is a frame showing the curve of the Earth, with the shapesof Long Island and Connecticut visible. "Our pictures turned out great," Yeh toldSPACE.com. "We saw some pictures from other launches by other peopleonline, so we kind of knew what to expect. But these pictures are unique 'causeeveryone launches form different locations." The MIT students aren't the first to undertake a near-space photographymission, but they appear to have done it for much cheaper than any previousproject, and without any of the professional aerospace equipment andinstruments often used. Yeh and Lee bought the camera online - a used Canon A470 forabout $40, and programmed it to take a picture every five seconds. They loadedit into a cooler along with a Motorola i290 prepaid cell phone, which theyprogrammed to constantly report its GPS location via text message. Indeed, the parts and even the expertise needed are socommonplace, the students insist, that anyone can carry out a similarexperiment - one need not be a rocket scientist, or even an MIT student. "All the parts we bought were off the shelf," Yehsaid. "The programs we installed were just standard - as easy asinstalling MS Word onto your computer." On launching day, Yeh and Lee's friend Eric Newton, also anMIT mechanical engineering graduate student, helped out. The three packed theequipment up with some newspaper for insulation and a set of $5 instant handwarmers to keep the instrumentation and batteries from freezing in the frigidtemperatures of the stratosphere. The students loaded their cargo onto a weatherballoon, and filled up the balloon with helium from a rented tank. Oncethey let go, it lofted into the air and climbed to about 93,000 feet (17.5miles, or 28.3 km) before finally bursting from the lack of pressure at highaltitude. Once the balloon popped, a parachute deployed and softenedthe fall back down to Earth. The ascent took about four hours, while thedescent lasted only about 40 minutes. Yeh said the highlight of the experience was when thestudents came upon the landing spot and first sighted their package. "We saw there was an orange little dot off in thedistance," Yeh recalled. "We were all very excited and we ran towardsit. We saw it was intact and all the electronics were still functioning." After that success, the MIT team is already dreaming bigger.Their next goal is to send a camera even higher, with the help of a rocketengine. Though he seems cut out for this line of work, Yeh said hedoesn't plan to pursue aerospace launches professionally. "It will probably be just a hobby," he said. "But I'm not ruling anything out." Since the flight, the students have been inundated withrequests for information from other would-be balloon launchers. They haveposted instructions and details of their project at their Web site, http://space.1337arts.com/.